General Harrison leaves Fort Meigs with a large portion of his force soon after General Proctor lifts his seige and the British withdraw. Fort Meigs is now under the command of General Clay. On July 20th Proctor again moves up the Maumee River, this time without heavy artillery. At the urging of Tecumseh the British again tried to take Fort Meigs. The plan was to stage a mock battle in the woods to the south of the fort. This mock battle was susposed to make General Clay believe that a column of American reinforcements were under attack thus the troops in the fort would rush to their rescue. The plan failed to produce this result as General Clay knew there were no reinforcements coming. The Americans sat in the fort and let the enemy use their ammunition. General Proctor decides against attempting an assault on the fort. On July 28th Proctor moves his force by ship along the shore of Lake Erie and up the Sandusky River, his goal is a supply depot located up river. But first he must take Fort Stephenson. Fort Stephenson was garrisoned by 160 U.S. regulars under the command of Major George Croghan. General Harrison was under the impression that Proctor's force was much larger than it was, he ordered Major Croghan to burn Fort Stephenson and either join him or retreat up to Sandusky, which ever offered the best chance of escape. Croghan insisted he could defend the fort and after a great deal of argument Harrison agreed to let him try. Harrison then moved his available forces up stream to Fort Seneca, here he was only ten miles away and could move to Groghan's assistance if he chose to do so. General Proctor thinking Harrison would do just that was in a hurry to capture the fort. Proctor first demands the Americans surrender, Major Croghan makes it clear that he will not surrender under any circumstances he also makes it clear he will fight to the last man. The British open fire from gunboats and artillery only to find that their 6 pounders have very little effect on the walls of the fort. Now on August 2nd late in the afternoon General Proctor orders an infantry attack. The British, Canadians and Indians move forward with determination. Croghan orders his men not to fire until the enemy is within fifty yards. Once in that range the Americans open fire with grapeshot from their 6 pounder and musket fire from inside the fort. After the first blast from the American cannon the Indians run from the battlefield. The British and Canadians tried time after time to get into the fort. Some made it into the ditch and up against the stockade, here they could go no further having no scaling ladders long enough or decent tools to climb over or punch holes in the forts walls. Proctor halts the attack at this point when he realizes his force can advance no further. After dark that night the Indians crawl up close to the fort and pick up the wounded British, Canadians and Indians that had fallen early in the day. 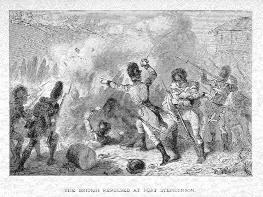 In the end the British had 30 men missing, 26 killed and 41 wounded. The Americans had one killed and seven wounded. The British force knew it was Proctor's incompetence that had wasted the day. Harrison's reputation was also tarnished after this battle. All through the two day seige he stayed at Fort Seneca, hearing the battle, he showed no interest in Croghan's fate. Had Croghan lost Fort Stephenson, Harrison probably would have set fire to Fort Seneca and retreated to Upper Sandusky. On the night of August 2nd a messanger brings word that the British General was withdrawing, Harrison had missed a golden opportunity to destroy Proctor's force. CLICK HERE to read a copy of the letter Major Croghan sent to General Harrison after the battle. CLICK HERE to read a copy of the British document from the Adjutant General in Kingston on this matter.